^ 明基, 金 (2009). 独島研究ジャーナル 2009年度/秋号（第7号）. pp. pp. 62-70..
^ United States Department of State (1951) (英語). Foreign relations of the United States, 1951. Asia and the Pacific (in two parts). Volume VI, Part 1. pp. pp. 1202-1206. http://digicoll.library.wisc.edu/cgi-bin/FRUS/FRUS-idx?type=goto&id=FRUS.FRUS1951v06p1&page=1202. ^ III. Korean Problems With Other Asian Nations. A. Japan. 1. Fisheries. The position of the Republic of Korea Government has been to insist on the recognition of the so-called "Peace Line." The United States Government has consistently taken the position that the unilateral proclamation of sovereignty over the seas is illegal and that the fisheries dispute between Japan and Korea should be settled on the basis of a fisheries conservation agreement that would protect the interests of both countries. 4. Ownership of Dokto Island. ^ 山﨑 佳子 韓国政府による竹島領有根拠の創作 pp.10. ^ The Embassy has taken note of the statement contained in the Ministry's Note that "Dokdo Island(Liancourt Rocks)...is a part of the territory of the Republic of Korea". 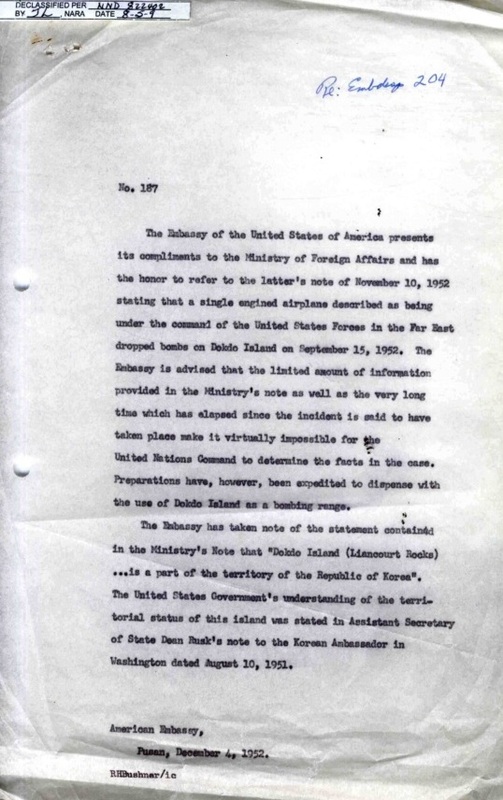 The United States Government's understanding of the territorial status of this islands was stated in Assistant Secretary of State Dean Rusk's note to the Korean Ambassador in Washington dated August 10, 1951. ^ 山﨑 佳子 韓国政府による竹島領有根拠の創作 pp.17.